In our facility built in 2000 we installed a state of the art office complex. This is under the same roof as our vats, so our customers can access all our services and never fight the outside elements. There are several features in our office we feel enable us to better serve our customer needs. Our lobby is intentionally oversized. We want our customers to feel welcome and not have other customers breathing down their back while getting their ticket. 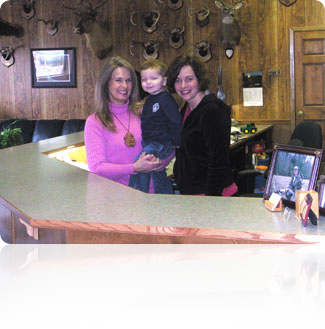 Our lobby is also a place for us to display bits of our history, family pictures, and hunting trophies. We installed a 5 station computer network. After several years of resisting the “technological age” we gave in and are very pleased with our progress. This system has allowed us to better analyze where we stand as a company. As a result, we are able to access information which enables us to be better managers. Our office manager is one of our greatest assets. Her smiling voice will greet you on the phone whenever you call or at the ticket counter when you drop by. Don’t worry about placing your order with her, she is as good as it gets in this business. If there is a problem with your bait or you would like the size of your bait tweaked he is the person to talk to. He oversees the vats, orders, and loading trucks. Any issue which isn’t to your satisfaction should be directed to him.